There is a critical food shortage in Africa; millions face the cruelties of hunger and starvation. The rainy season is often very short in Africa and the long dry season makes it impossible to grow crops without sufficient water. Farmers must often carry the little water they have for their crops from long distances. Crop yields are low leaving little income to support a family. Reach the Children is helping communities with expert coaching on irrigation, cash cropping and marketing, and provision of equipment and resources to dig wells and implement new techniques. The average farmer in West and East Africa earns less than $1 per day. With irrigation and a community effort, the farmer can earn more than ten times that amount, thus having the funds necessary to provide for his family and additional orphaned children. Along with increased crop yields, cleaner water is available to the community members. This results in fewer water-born diseases and decreases the spread of disease through more hygienic conditions. 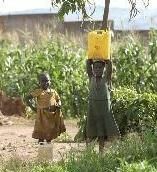 Reach the Children helps provide large irrigation wells and drip irrigation to farmers and communities, thus enabling cash crops to be grown, increasing harvest yields, and potentially feeding Africa’s population through droughts.